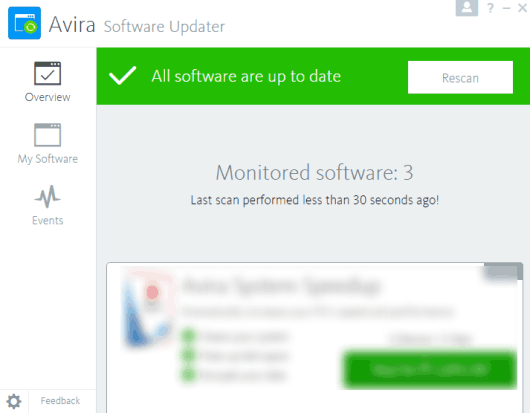 Avira Software Updater, as the name indicates, helps you automatically scan PC for the outdated software, download and install them. Outdated software are the soft target for malware to cause the security threat to your PC. 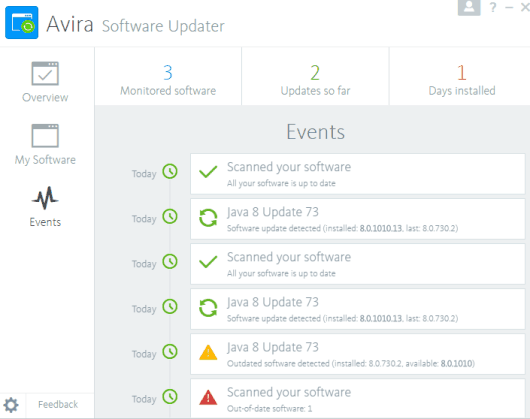 Using this software, you can easily detect software for which updates are available. After that, you can download updates and manually install them to keep the installed software updated. Its interface is quite good and very simple and even a novice user can operate it without any help. You can also remove or uninstall any software using its interface. Apart from that, it stores Events which help you check when did you install this software, how many software are monitored for scanning and the total number of updates done by you using this software so far. It didn’t scan all the software. I wasn’t able to find the reason. It failed to remove a few software. 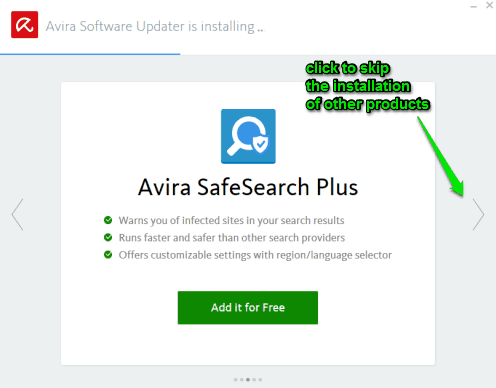 You also must be careful during the installation as it prompts to install other native products: Avira SafeSearch Plus, Avira System Speedup, etc. Use the Next icon to ignore such products. After completing the installation, launch the software and it will start scanning PC for outdated software. This part comes under Overview section. The scanning process is fast but it might not be able to scan all the software, as the same happened to me also. After completing the scanning, it will show how many outdated software are there. 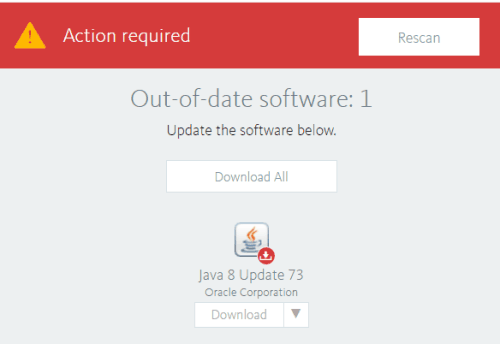 If updates are available, you will be able to download and install them manually. You can also access My Software section. This section will show all the monitored and unmonitored software. 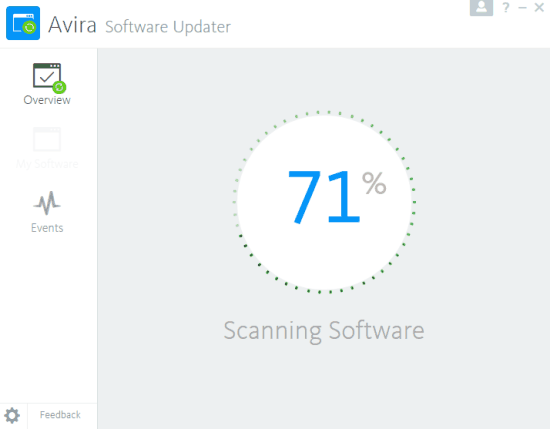 You can start the scanning again but it won’t help you to scan the unmonitored software. There is also no way to scan any unmonitored section separately. All you can do is remove software from PC if needed. Whenever you want, you can scan again to see if some other updates are available for your installed software. 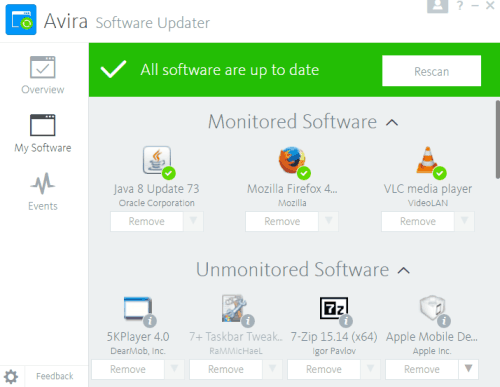 In case you want to check how many software it has monitored till now, which software were updated using this software, and other details, then you can open Events section. That section will show all the activities done so far. This can be a very good software updater and attract users, but I think the software is not perfect yet. Based on my testing, I can say it needs improvements. Maybe this software itself requires an update to make it perfect. Still, I will say users now have one more choice to check PC for outdated software and download the updates. Try it yourself.